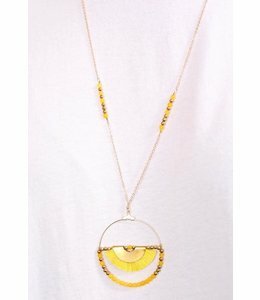 A long, gold necklace featuring a circle decorated by yellow and gold beads and yellow fringe fan. Gold hoop decorated by yellow and gold beads and yellow fringe fan. 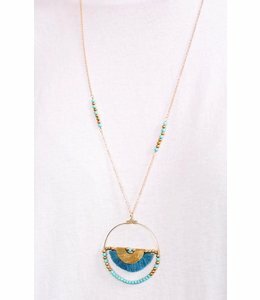 A long, gold necklace featuring a circle decorated by turquoise and gold beads and teal fringe fan. 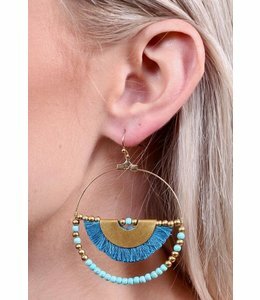 Gold hoop decorated by turquoise and gold beads and teal fringe fan. 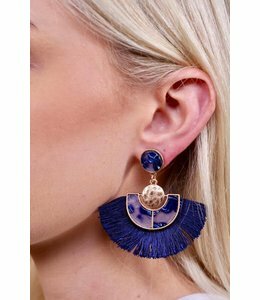 Fringed dangle earrings with hammered gold and resin details in a semicircle design. Dangle earrings featuring gold-toned and resin hoops. 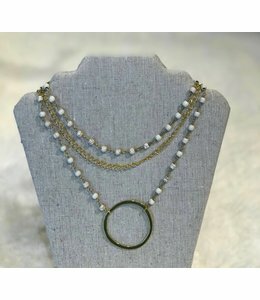 A layered, gold-tone necklace with white beads and a large hammered circle. 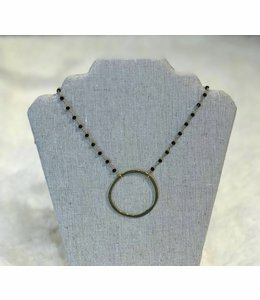 A gold-toned necklace with small black beads and a large hammered circle.